Dakentai-jutsu stands for the basic striking technique of Ninja, including knowledge of hot buttons, the methods of these points affection and special training of body parts. • Koppo-jutsu is the technique of affecting the bone system of the enemy through breaking or injuring. This technique focuses on injuring the minor bones of the opponent which are not protected with the muscular tissue and are, thus, too vulnerable and affected. When affected with a precise pile-driver, the opponent is not able to defeat any longer due to pain shock, loss of consciousness, considerable restriction of movement to fatal cases. The warrior accentuates to the development of striking surfaces of the strongest and hardest body parts, namely the fist, the sharp of the hand, elbow, feet and knees. • Kosshi-jutsu is the technique when muscles and internal organs are injured due to precise strikes. This technique accentuate injuring of vital nerve centers located in muscular tissues with the aim to physically injure vitally essential internal parts of body as liver, heart, spleen, kidneys, genital organs and others or disturbance of lower extremities mobility for short period of time. 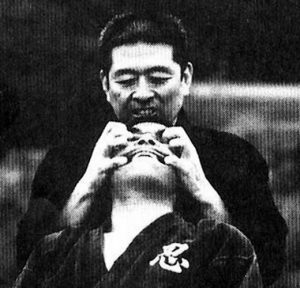 Atemi-jutsu is the technique that also applies strikes made precisely to biologically active points of human beings (shiketsu) located on particular meridians of the body. There are 700 points known so far. Atemi-jutsu is the technique mastered by individuals only. One should know the flow paths of vital power (ki) and the time of the highest activity depending on the body complexion, season and a lot more factors to affect. It takes long years of through and solid training with the highly qualified specialists to master this technique. In no way, these techniques are mastered easily and at one. Being strong means being trained.